Compare power alternatives for oper- ating cost — performance. Not tradition ... not old standards. Fuel efficiency. Fuel represents up to 90% of an engine's owning and operating cost. So it's easy to understand why the Cat fuel efficiency advantage can save you so much. Model shp rpm shp-h 3508 752 1600 .0522 12V-149 NA 675 1800 .0562 3512 1139 1600 .0505 16 V-149T 1145 1800 .0558 3516* 1504 1600 .0496 7.1% 9.5% *No comparable rated Detroit Diesel 149 Series engine. But compare the 3516 with an EMD engine. Performance. Ask someone who has operated both makes. The Cat 3500s with higher cylinder displacement handle the load better and have added punch for superior response. Cat Engines makes inspection and adjustment easy. Fuel and oil filters and lube oil are changed at the same time. On the 3512 and 3516 this maintenance is required only once every 1,000 hours. Price. It may be a surprise ... the 3500s are very price competitive, even before you total up lifetime owning and operating savings. Diesel models operating with four more cylinders each. So when you overhaul, you'll have fewer parts to replace, lower labor costs. The way they're built. The 3500 Series are heavier than Detroit Diesel 149 Series engines ... but the extra weight is in critical areas — Between cylinders, in the crankshaft — where lighter con- struction can lead to shorter life and more parts replacement. Have your Caterpillar Dealer help you make a comparison. He'll start by running a fuel analysis comparing Cat to Detroit Diesel or any other make engines. Then have him provide you an in-depth investment analysis so you know what it costs to own and operate a Caterpillar Engine over its long lifetime. Consider your alternatives . 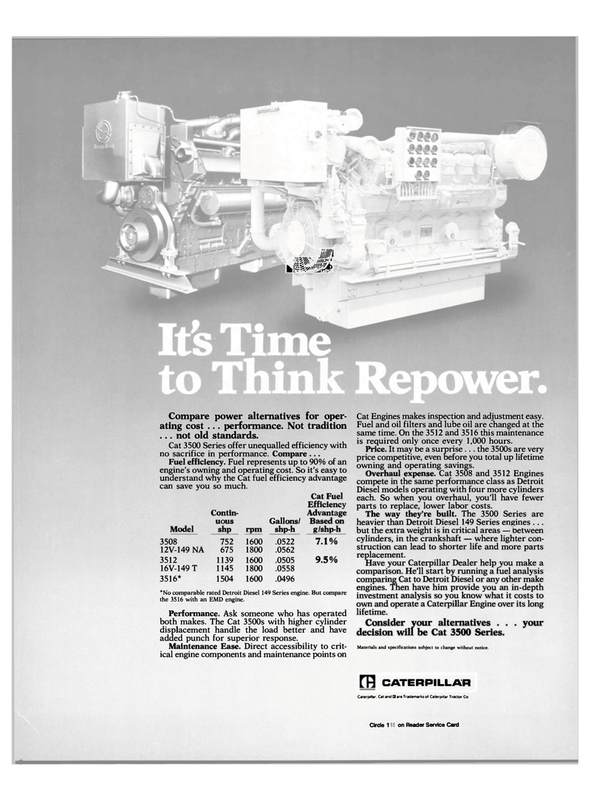 . . your decision will be Cat 3500 Series.